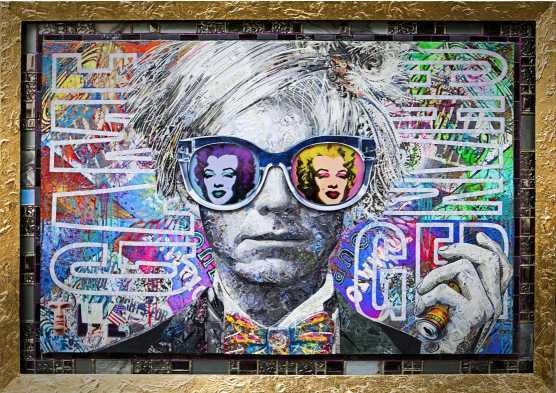 Bugazzi started as a photographer out of college, then later used collage…adding additional media to his work such as magazine clips to create pop works of art, such as his well-known Marilyn Monroe series. He has created a niche for his art and was recently asked to exhibit the collaboration work he created with Karen Bystedt and The Lost Warhols at Context Art Fair at Miami Art Week (December 2018), and at the LA Art Show this past January 2019. He continues to shoot photography, all the while creating one-of-a-kind artworks paying homage to pop sensations such as Madonna, Queen Latifah, and Michael Jackson…just to name a few. One such work is entitled Frida Rising. This piece is inspired by the struggles of Frida, and the beauty of her and her work, and what she was able to accomplish given her circumstances in life,” explained the artist. He is excited about showing his work at the upcoming Art in LA Affair on February 13th through February 17th. The annual art fair is presented by AC Gallery, in partnership with Artsy. The opening night gala offers an open bar, appetizers and live music in the sculpture garden. A new interactive series will be featured at the art fair. Bugazzi has created it so that people can participate and take selfies. On Wednesday, February 13th, Art in LA Affair officially opens from 8-11pm. Opening night tickets are $50 and include red carpet arrivals, cocktails, appetizers, and live music in the sculpture garden. Or skip the opening and attend the art fair. Show hours are: 11am to 4pm throughout the weekend and cost $10 per person.